I think it's important to explain why I make my skull designs. Yes I ride a motorcycle, I love the Day of the Dead (Dia de Los Muerto) style but I make my skulls to remind us we are mortal. Our life has a expiration date and it is important to live it to the fullest. To live it right, to treat others with respect because eventually you have to answer for it. 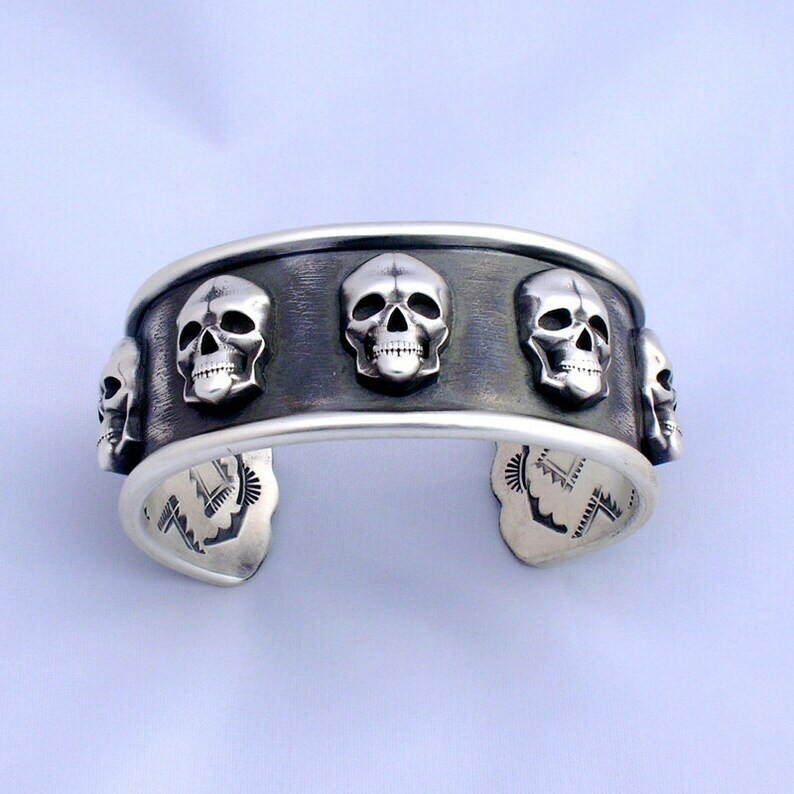 This one big heavy sterling silver cuff with five (5) 20mm and two (2) 15mm solid sterling silver skulls. Cuff is approx 6.5 inches inside diameter, 1.25 inch wide with a approx 1.25 inch opening. Can be adjusted slightly when you get it. Also available in a medium size for smaller wrists, see picture 3, check my other Etsy listing to purchase. "PRECIOUS METAL CREATIONS FROM THE HEART & SOUL OF SANTA FE"
© Copyright 2013 Santa Fe Silverworks by Gregory Segura - All rights reserved. All content, photos, artwork, descriptions, designs, etc. may not be used without our explicit permission. Each item is made when ordered unless otherwise stated so please allow up to three weeks, but most orders are shipped within one week. This is now my favorite piece of jewelry. I will definitely purchase additional jewelry from Gregory.